Precast Concrete Magnets – With the rapid development of Construction industry, Only depending on casting concrete on site to build the different kinds of projects can not been satisfied, Current Building projects are required to be not only be FASTER , also be Economic, so there come out a new mode of construction called PRECAST CONCRETE. Concrete Formwork when concrete is casting. 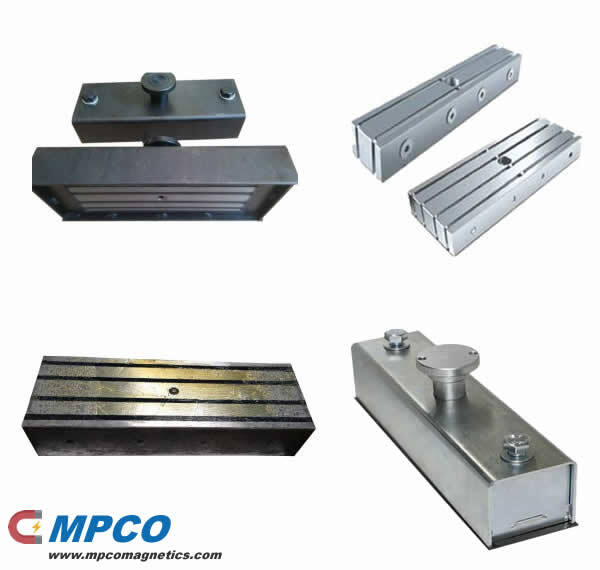 According to the dufferent magnetic force, currently MPCO MAGNETICS designed and manufactured five type: 900Kg, 1600Kg, 2100Kg, 2500Kg and 3100Kg. Shuttering magnet box is composed of steel armature, big magnet with push down and pull up button. The use of shuttering magnet is very simple, just push down the button and the shuttering magnet will firmly catch the shuttering formwork by the strong magnetic power which ranged from 900~3100 kgf. It is also easily turned off. It’s enough to raise the button using a special separation device.